I decided to hop a bus to Central Arizona and go for a ride. Hope you enjoy this short video I made before getting started in Oak Creek Village. I rode 30 miles via Sedona to Cottonwood and took the Verde Lynx local bus back for $2. If you like this video please share it and send feedback, and I will make more like it. P.S. I've been working in Tempe, Arizona for a bit while enjoying summer in the winter and saving up for my next trip. 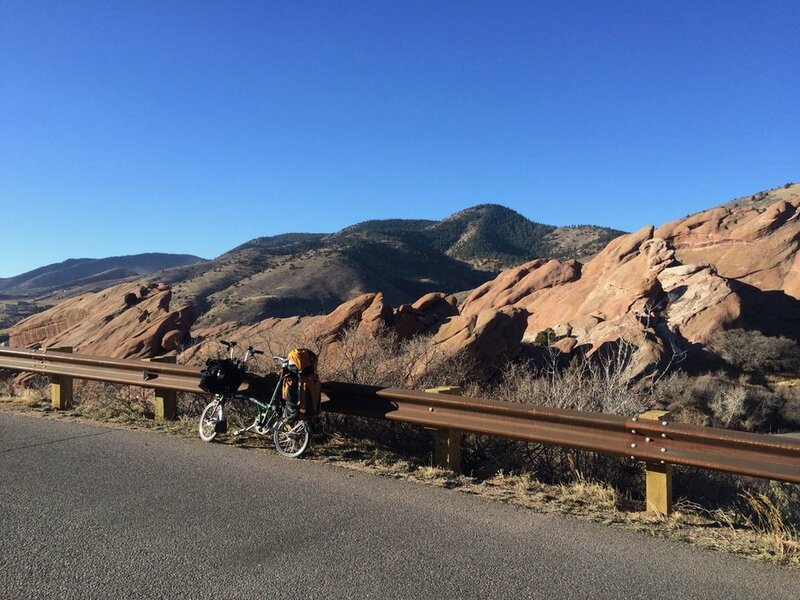 Also accepting 1-30 day bike tour ideas in the western US. This episode covers from Belfast to Blue Hill, one day before reaching Bar Harbor. INTRO: In late August I moved out of my apartment in Boston, put about 8 boxes into storage, and took a bus to Brunswick, Maine with my bike and camping gear. By popular request for tour updates, I decided to record a series of brief, daily, mostly unedited episodes to share here. Note that at the time of upload, I have completed my tour in Burlington, Vermont, and I will be compiling and uploading the remaining episodes very soon. In late August I moved out of my apartment in Boston, put about 8 boxes into storage, and took a bus to Brunswick, Maine with my bike and camping gear. This episode covers from Brunswick to Belfast. By popular request for tour updates, I decided to record a series of brief, daily, mostly unedited episodes to share here. Note that at the time of upload, I have completed my tour in Burlington, Vermont, and I will be compiling and uploading the episodes very soon. There's a tendency among bike advocates to champion the delineation of a "bike space" even without any actual space being created. You know, "if there's room for a bike lane" without changing anything else on the street. At best you get no benefit, and at worst you're given a "safe space" that isn't safe at all. This bike lane is almost entirely in the door zone, which is why these users are staying to the far left. But cars will pass too closely (up against the line) so they really should be riding outside the bike lane for safety, but then motorists become arrogant and hostile as they think you're being a jerk. That's when cars are parked flush against the curb. Even in the summer they often intrude into the bike lane. But in the winter the lane is completely taken away for car parking. Bike lanes in Boston are only open 1/3 of the year. And it's always the bikers and pedestrians who lose out; car drivers get plowed streets and the same ability to park their personal property: who cares if anyone else has trouble getting around? You can see the city's priorities. They claim to be a "world-class bicycling city" where "the car is no longer king" but what this street design really does is appease some bicycle advocates while maintaining a car dominant streetscape. Fail. This major business district is also a major transportation corridor. The 39 bus seen here is one of the highest ridership MBTA lines, yet all winter it struggles to pass arrogantly parked cars, often waiting for opposing traffic before it can cross the centerline. Buses often can't pass each other. In a fairer city, cars that park outside the designated space would be ticketed and towed immediately. Better yet, restrict parking in certain spaces that can be used to store the snow that the city should be removing from sidewalks. Transit Tip 12: Keep pedestrian and bike paths free of obstructions. There's usually a buffer space between the sidewalk and the street where signs, utility poles, mail boxes and other things can go. Bus stop signs, for example, must be placed 1-2 feet back from the curb so the bus mirrors don't hit them. But if you get rid of the buffer area to add parking or maximize the driving lane width, don't encroach on the already narrow path for parking meters, construction signs or anything else that doesn't belong there. Also, to all the highway engineers out there, if you put any objects on the sidewalk, remember that the sidewalk has been narrowed. It's not a 5-foot (1.5m) sidewalk if 2 feet are taken up by poles and signs. This is a 2-foot (0.6m) clear width, less than the minimum required, even while the driving width is at least 30 feet (9m). 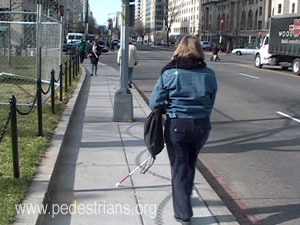 Check out Perils for Pedestrians has a wealth great info on walking paths. Bixi, which runs the bike sharing system in Montreal and sells the bikes, stations and software to other cities, has filed for bankruptcy. The city has taken over the operation of the local network at an estimated $1.5 million cost. Like most bike share hosts, Montreal has thus far refused to contribute to operating costs. But if we consider the usage, about 2 million trips per year, I agree with the new mayor that $0.75 per trip is a great investment for a healthier, more accessible city. Let's hope support remains high among residents for continued operation. Every city that has implemented a bike sharing system (as far as I know) has done it the same way: rely on a private company to run it, refuse to spend any public money on it, then complain about the over-reliance on advertising, station placement and failure to reach low-income and minority communities. Perhaps it's a small issue: if you can make it run well without city funds, well, more money for schools and libraries. Except what happens when we use a federal grant for a new library building but then expect managers to solicit sponsors to help pay for books and computers? Same with bike sharing: at some point ad revenues decline and things fall apart. Like bus routes, many stations will be critically important but never profitable. But social equity and environmental justice goals don't easily mesh with running a business. If we are serious about encouraging bicycling as healthy and effective transportation, cities should start funding and operating bike share as a public service, integrated with other modes of transportation. The Montreal mayor's comments are encouraging, as Bixi certainly is a fantastic public service worth paying for, and Montreal's transit agency STM has put together a plan for running it. After all, bike sharing only supplements the trains and buses that form a comprehensive, useful transportation network for maximum mobility. Transit Tip 10. Clearing snow from sidewalks: how to do it well. Thanks to Allina Health for showing how to clear snow efficiently and effectively. No excuses, just a safe, clear sidewalk. Transit Tip 8. Sidewalk maintenance & snow clearing should be a public service. Every year, despite lots of rhetoric, the same problem illustrates just how cities really feel about walking, biking and public transportation. There has been snow every year for centuries and it will continue to fall, yet somehow we still haven't accepted that the current system for getting around in the winter doesn't work. Cities clear the roadways for cars only, ignore everyone else, and then blame property owners for not all coming out with a tiny plastic shovel and scraping their piece of sidewalk clean. It is time for cities and counties to take responsibility for maintaining safe, clear sidewalks everywhere. This spring we should survey every sidewalk and pedestrian path and make repairs where necessary, so that next winter we can simply drive a bunch of snow blower around the city and get the job done. UPDATE: like this.